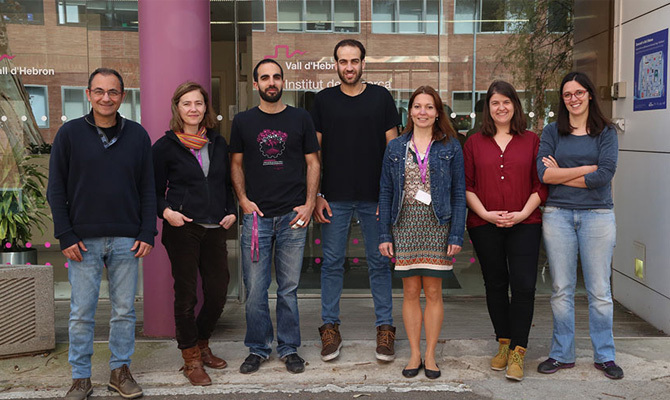 For the first time, the Vall d’Hebron Campus has a FET Innovation (Future and Emerging Technologies) project that has been awarded within the Horitzo 2020 program to the CIBBIM-Nanomedicine. Drug Delivery and Targeting research group. Addressing and Pharmacological Release that leads Dr. Simó Schwartz Jr. The EVO-NANO project aims to develop a virtual simulator, called NanoDoc, which will test the behaviour of nanoparticles within a tumour and with other nanoparticles. This is a multidisciplinary project that will develop a consortium of European research centres with the aim of creating a platform that is available to everyone and at the forefront of Nanomedicine that facilitate the rapid development and testing of new treatments against cancer. “It will become an evolutionary platform capable of autonomously offering innovative, efficient and adapted solutions that can also be transferred to other complex biomedical challenges,” explains Dr. Schwartz Jr.
“This simulator will help to understand how nanoparticles interact with each other and in a biological medium when they are injected, in large volume, into a tumour or anywhere in the body,” adds Dr. Schwartz Jr. And thus, nanoparticle designs that have an optimum behaviour can be achieved, which will then be studied and validated in biological models in vitro and in vivo in stem cells of breast and colon cancer. Thanks to the acquisition of this project, Vall d’Hebron becomes the health campus with more European projects active in Nanomedicine of Europe with six major H2020 projects and three ERA-NET projects. Berenice (BEnznidazol and triazol REsearch group for Nanomedicine and Innovation on Chagas disease) of the research group on infectious diseases. New Magnetic Biomaterials for Brain Repair and Imaging after Stroke” (MAGBBRIS) of the Neurovascular Diseases Group.